Whether you have completed the rightsizing process or have just begun to think about how, what, and when you will get there, regular meditation can offer a great deal of help. Not only does it help to clear your mind, but it can also offer a range of physical, mental, and emotional health benefits. Read on for meditation benefits that may spark your interest and encourage you to take on a new life activity! Enhancing digestion. In addition to ensuring that you are consuming nutritionally balanced meals, meditation is strongly encouraged for improved digestion. The deep breathing that occurs during meditation will improve circulation and increase oxygen levels in the blood. Additionally, calming your mind and body with meditation puts your body in a relaxed state. Developing a sharp, focused mind. Meditation can increase your mental alertness and increase your ability to focus. As MindWorks explains, "Regular meditation causes the brain's physical structure to change. For example, the amygdala region that's associated with processing negative emotions such as stress, worry and anxiety often shrinks, while the areas responsible for self-awareness, personality development and planning (such as the prefrontal cortex) increase. 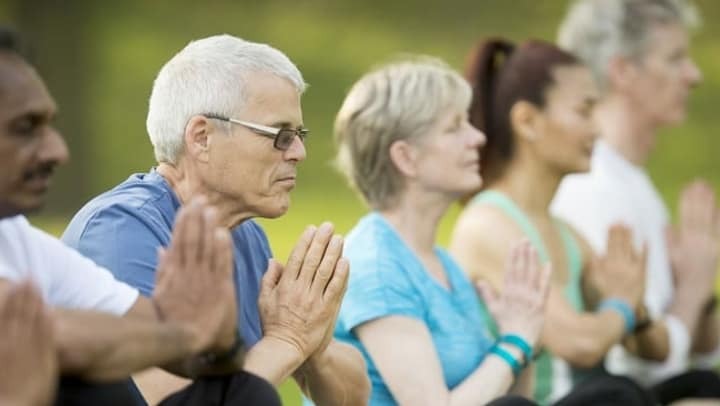 As a result, meditators experience improved focus, creativity, and cognitive function: a great boon for seniors." Managing moods and emotions. Heightened negative emotions, such as stress, can be common among any age group. Meditation and mindfulness can help people manage those emotions and amplify positive ones. Improving memory. Practiced regularly, meditation, and mindfulness exercises enlarge parts of your brain that are responsible for memory and help to maintain both long-term and short-term memory functions. At Avenida, our Five to Thrive wellness calendar offers a myriad of classes, programs, and events that address key areas of healthy aging, including regular meditation sessions. Combined with other healthy activities, this practice will surely add to your health and vitality!